Contributing to improved international service standards through promoting a better understanding of Knorr-Bremse products and systems. Increasing vehicle availability through efficient maintenance. Knorr-Bremse, as a market leader, has proven high standards for its products and is able to draw on extensive, specialized expertise. Knowledge of different products, manufacturers and operators is the key to offering a premium training portfolio. This is where RailServices training courses come in! Their modular structure means they can be adapted to the specific needs of individual customers. Theoretical knowledge is combined with practical exercises on original vehicles. Experienced trainers and detailed documentation ensure the long-term success of the training. 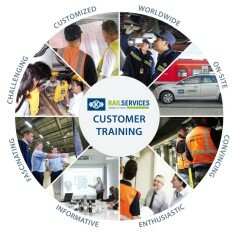 RailServices includes proven training formats and the latest forms of e-learning in a combined program. The strengths of face-to-face learning and the effectiveness and flexibility of electronic learning methods produce outstanding results. Knorr-Bremse offers the highest standard of customer focused, flexible training. The RailServices Training Catalogue contains information about training procedures and enables customers to choose a specific training course to enhance service quality and achieve cost and time savings.